Are you ready kids? The first season of the new Bookaboo TV show premieres October 28, on Amazon, in the US and UK. Amazon says the new series for preschool-aged children “…celebrates the fun and benefits of adults and children reading together.” Bookaboo is created by Lucy Goodman, Founder of Happy Films, and produced by Happy Films and Sinking Ship Entertainment. Guest stars in the first season include Paula Abdul, Rachelle Lefevre, Molly Parker, Hannah Simone, Emily Van Camp, Selma Blair, Michael Sheen, Guillermo Diaz, WWE Wrestler Adam Copeland, NASA Astronaut Commander Chris Hadfield, and NFL player Antonio Brown of the Pittsburgh Steelers. Learn more from this Amazon press release. SEATTLE–(BUSINESS WIRE)–Sep. 28, 2016– (NASDAQ: AMZN)—Amazon today announced its brand-new Amazon Original Kids Series, Bookaboo, is set to premiere October 28 on Prime Video in the US and UK. Already a full-fledged international hit, the series for preschool-aged children celebrates the fun and benefits of adults and children reading together. 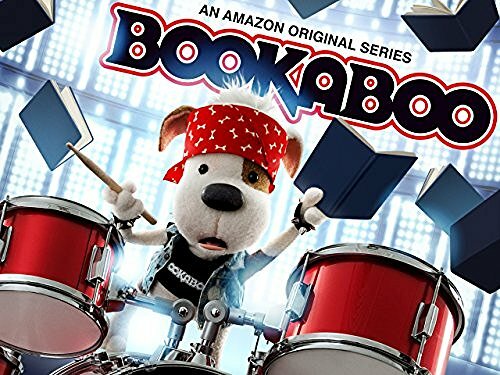 Bookaboo inventively combines puppetry, live action and CGI animation, and every episode features a different celebrity guest, who goes “backstage” to share their favorite picture book with Bookaboo, the adorable world-famous drummer puppy and star of the show who needs to be read a book a day or he just can’t play. Among the series special guests are Paula Abdul (American Idol), Rachelle Lefevre (Twilight), Molly Parker (House of Cards), Hannah Simone (New Girl), Emily Van Camp (Captain America: The Winter Soldier), Selma Blair (Legally Blonde), Michael Sheen (The Queen), Guillermo Diaz (Scandal), WWE Wrestler Adam Copeland, NASA Astronaut Commander Chris Hadfield, and NFL player Antonio Brown of the Pittsburgh Steelers. Bookaboo, the latest addition to Amazon’s award-winning preschool programming slate, is created by Lucy Goodman, Founder of Happy Films, and produced by Happy Films and Sinking Ship Entertainment (Odd Squad, Annedroids). What do you think? Do you like the sound of the new Bookaboo TV series? Will you and your family check out the premiere on Amazon? Tell us. More about: Amazon TV shows: canceled or renewed?, Bookaboo, Bookaboo: canceled or renewed?